There was something a little bit different about Vanuatu's Chad Crittenden. It was hard to place your finger on it... but there was just something about the guy that really made him stand out from everyone else. It took me a few episodes to figure it out, but in time I finally identified the mystery variable. I finally figured out what made Chad so different from everybody else. And the funny thing was... it had nothing to do with the fact that he only had one leg. 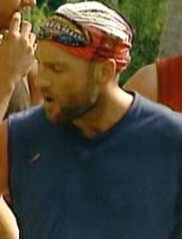 When I used to write my Survivor novels, I had one hard and fast rule that I never wanted to break under any circumstance. I never wanted to describe a character's mouth as being "open wide with surprise." I mean, it sounds good in print and all, but it's such a ridiculous writing cliche that I never, ever wanted to see it in my story. After all, whose mouth actually opens wide with surprise? Does that actually happen in real life? Ever? Has it ever happened? And why do so many writers insist on using that phrase? 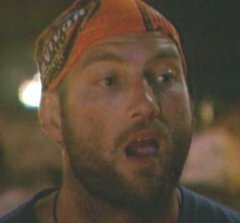 In fiction, why are Survivor players' mouth always popping open in surprise? 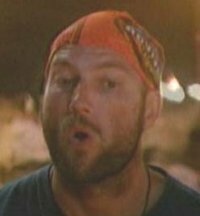 Chad's mouth was agape so many times in Vanuatu that he started to look like a blow-up doll. Either that, or the Zoltar machine in the movie "Big." 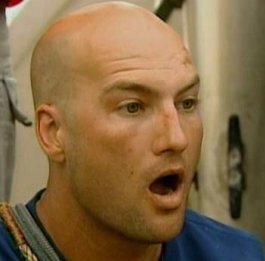 And the visual of Chad opening his mouth in surprise ended up being one of my favorite running sight gags in Survivor history. I'll probably even use it as a running joke later in this list. You just watch and see.